The cult of the tightrope The thirteen knots rope is the apparent sign of a vast culture. In ancients civilizations from India to Egypt, references to the rope even take a religious and ritual aspect. The vedic rope tensioner (sulbaka) like the egyptian harpedonapt deploy a knowledge whose origins are confused with those of architecture - one of the major aspects of Neolithic. At the other end, in the Renaissance, the tarot images pay homage to this : especially in the figure of the Hanged Man, the XII arcane, symbol of initiation and study. The vocabulary of nature At Paleolithic, man appropriates the basic vocabulary of geometry by observing nature. The line comes from the sea horizon, the circle reveals its curve when a stone falls into the water, and the sphere appears when the rain is so strong that it makes bubbles. The wisdom of our ancestors associate with the Water element with the concepts of Inspiration and Origin. The stars forge links that fill eyes. Men practice a kind of cons-point among the stars, and they cross strings becoming magical... Beside : « La Vénus à la corne » of Laussel Musée d'Aquitaine, Bordeaux In its inspired forms, by the nature of the woman, this Venus shows the geometry of the final Paleolithic, 25,000 years BC. The rope, ancestor of compass and ruler The rope is both a ruler (straight), a compass (radius of a circle around a pole) and even a pencil (once soaked in chalk). Attached to two stakes, it can draw an ellipse, and just fold it in half to find the middle. This is the beginning of measurement, the first step towards Magic. The rope and the right angle Just two strings. One is stretched between two posts and the other, longer, forms a triangle from the same points. The middle of the two strings defines a right angle. The aristocratic compass will take up this idea. It is true that it is beautiful, all metal, and much brighter than its paleolithic grandmother ! However, the sign painter still prefer the old piece of string to trace his letters. This ancestral link fits in your pocket without poking the thigh! The thirteen knots rope A Triangle for surveyors ? As we have seen, there we don't need a thirteen knots rope to form a right angle with three stakes. The rope of surveyor, with its twelve equal segments (between the thirteen knots), appears in the egyptian world. With this iool, they reconstitute on the ground a 34-5 triangle : the famous Sacred Triangle. A right angle is naturally formed between the sides 3 and 4. In reality, this right angle is one of the aspect that the Sacred Triangle bears. We can assume that men have approached the right angle, and then gradually developed geometry until the advent of the Sacred Triangle - with all its properties. We are interested here in these premices. When and under what Civilizations this geometric tool appears ? Pythagoras : « To be or not ? To be ! » Throughout the study, we will compare two cultures that are somewhat “separated” by the pythagorean theorem. The emergence of this theorem, as a practice, is now widely demonstrated as anterior to the mathematician, whether in China, Mesopotamia and India. However, for clear explanations, it is easier to distinguish the geometry without/before, and the one which incorporates the famous theorem. A number of paradoxical situations justify this attitude. For example, the Egyptians had access to this tool, eg through their interaction with the Babylonians. They carefully circumvented the need, and continued to develop the principles of a paleolithic type of geometry : geometry with eyes. So true that they even used the golden ratio as a pure geometrical phenomenon, and obviously neglected its numerical expression. Pythagoras, or more precisely the Pythagoreans, have unified the mesopotamian and egyptian currents. These two kind of skills are now further documented historically (it remains to establish their common allegiance to a previous single stream, megalithic). The « geometry with eyes » will enjoy the contributions of the Babylonians about numbers, and not just their computing power. The conjecture of Plimpton is a clear indication of their level of reflection. This fusion of Egyptian and Mesopotamian mathematics is the basis of Western sacred geometry (of cathedrals builders). In this sense, even if Pythagoras is not the pioneer that history has long shown, his role remains essential. In practice, the most recent historical updates don't change anything. Nothing to the enlightened coherence of egyptian geometry - which will mark “our” sacred geometry. Nothing to the logic of development in geometric principles, because they get around the theorem. Nothing to the light of calculating, the values areoriginally designed as purely geometric. Only mathematics are able to face so many questions, without losing their coherence ! We now turn to the layer of paleolithic geometry (without Pythagoras). Homo habilis becoming sapiens Left : Technic of Levallois-Perret - Mousterien (300 000 à 30 000 ans AEC) Right : Flat bone eyed needle, Grotte de Gourdan-Polignan, Haute-Garonne, France Magdalenian, Upper Paleolithic (17-10 000 ans AEC) Men able to make such objects have a sufficient dexterity to draw a grid on the floor - 4 tiles of 6... We must mention the technique, called Levallois-Perret, by which the stone cutter draws an arrow on a nucleus of flint : it reveals its final form at the last gesture (the archaeologists spend years to master this practice).The rectangle of proportion 3 and 2 occurs regularly in architectural motifs. We understand the success of this "template" through what the grid can produce. The solar wheel Draw a circle of radius 2, in the center of the 4x6 grid. The curve crosses the grid every 30° and thus defines a partition of the circle into 12 equal sectors : this scheme is the origin of the time dial, and also the zodiac. The √ 3 is not from the epoch - we have to learn how to think with eyes. For the paleolithic man, the proportion of √ 3 is “where” the circle crosses the grid and cuts the right angle into three equal parts. To get this proportion from a unit, he draws a circular arc whose radius is double, and he locates the point where the arc intersects the vertical. Early definitions (basic) of sacred geometry are all like that : “traced with the rope”. The hexagram Subtle relationships appear, which combine the angles and measurements. For example, and this is the egyptian definition : A rectangle proportioned by √3 contains 3 rectangles of the same type. The side of the equilateral triangle is 2√ 3 in this Image. The arising question is when (Babylonian?) this expression takes its meaning. The hexagram of Solomon is one of the leading figures born from the rope. The center of gravity of the two triangles (water and fire), and the centers of their circles inscribed and circumscribed coincide. The star is marked by 6. Without prejudging the sense that paleolithic men gave to it, and the Egyptians and even the Pythagoreans, the ideas connected to this number are, in what is now the tradition, although “recent” : Love, assembly, association, loyalty, balance - Eternity/cyclical sun (surface of the sacred triangle), and of course hexagram. Man is naturally good ... In mathematics ! The Pythagorean theorem, or that of the diagonal (this nuance requires to be treated separately) establishes the height of the intersection : it is √3 times the radius. In symbolics, the root expresses the source, the origin, the mystery of an element. However, even without the development of this notion, the Vesica Piscis refers explicitly to 3, taking with him two symbolic values : sacred and feminine. The figure measures three times the radius of the circle in its width. The calculation can “establish” 3 as feminine and heavenly. On this occasion, it may be noted that the word "heavenly" is gaining a nuance in front of the archaic sky of fertility - from which it comes. This new definition is at odds with the old myths where the sky is masculine. The symbolist must at some point choose between a primitive type inheritance and the truth that mathematics reveal to him. The Ancients were relying to beliefs when they did not have the means to do otherwise, but as soon as the observation tool or the theoretical construction was progressing, their reason was going ahead. The pentagram and the vesica piscis For convenience, the grid is doubled here: a tile is therefore 1/2. The pentagram is marked by the golden ratio. To reveal a real relationship, a coincidence of figure, he must grow from the center of the circles of the Vesica. φ = (1+ √5)/2 = 1/2 + √5/2 The translation is a square (of 1/2) plus the diagonal of a double square. We defer the total to the vertical height through the almond. Now simply extend this bar of golden ratio until the circle to complete a branch of the pentagram. The addition of 1 unit by the circle establishes its center as the point of intersection of the branches (this is the point of separation according to the golden ratio). Then, from the bottom point, we pass through the symmetrical center, on the left of the Vesica. These demonstrations need only the axioms of similar triangles. With this modest equipment, our ancestors were able to get all the secrets of the pentagram, here in harmony with the Vesica Piscis. N.B. : 8 of 10 points of the pentagram are on the circles. This chapter reconstructs the extraordinary consistency of egyptian geometry. It is an essential part of its corpus. In scientific terms, the logical arguments are limited to the axioms of similar triangles. In plain language : the visual evidence is sufficient to explain everything (and therefore understand), and for all figures. Raphael Legoy proposes to designate these approaches under the term of monstrations. A number of prejudices fall before this body of evidence. Admittedly, the Egyptians were practical minded. But they deserve a real consideration for their theoretical. The geometrical skills don't have the empirical character (and inexact) through which they are commonly considered. This also applies to other civilizations, with other equally strong arguments. In general, as soon as they awake with mathematics, men build their knowledge with a mindset very much closer to ours than we suspected : the spirit of proof, with remarkable properties, in a strong overview. The sacred triangle The 3-4-5 triangle, also called sacred triangle or triangle of surveyor, is the queen figure of sacred geometry. It carries with it all the numerical values of the symbolic, i.e. the integers from 1 to 7, the golden ratio (φ), and the root of three(√ 3). It gives meaning to the grid, and to its unity. The main monstrations that follow are unpublished. Some of them concern properties that history has forgotten (or ignored) for centuries. This is the case of the golden ratio of the triangle, which remained hidden on one of its bisectors. When the author is not specified, the monstrations are signed Yvo Jacquier. The three first measures The sides of a triangle forming the right angle are called cathètes in french(nf), besides the hypotenuse. The three bisectors are the natural diagonals of a single, a double and a triple square. The sum of the first symbolical number, called “order of the bisector”, and the measure of the length of the side, that the bisector crosses is always 6, i.e. : 1+5, 2+4, & 3+3. If you stop at this definition, the length of the third side 5, here marked AC, is axiomatic. It took years to resolve this issue and it turns capital. Indeed, according to the length of five is admitted or proven, egyptian geometry does not enjoy the same status, particularly besides the ones that build the Greeks. Did Egyptians practice science or “DIY” ? First monstration Let a triangle ABC, with AB= 3 vertical, et BC= 4 horizontal. Let the point E, situated at two squares under the point B : AE = 5. According to the grid, EI = IC = ∂ (with ∂ diagonal of the double-sqiare) AI is orthogonal to EC So AIE et AIC are symmetric. So AE = AC = 5 Quod Erat Monstrandum N.B. : The incircle of the triangle is not involved in this demonstration. Yet it reveals its measurements. Then, the first six first integers are symbolically united by a single figure, including the number 6, as area of the triangle. Figures of transition A vesica piscis in the triangle The sacred triangle faces a second time the vesica piscis. On the displayed image, on the screen, two colored lines enhance the structural links, between the centers of the large circles and the elements of the triangle. The logic of proportion In this position, the height drawn at the point of the right angle (of the triangle 3-45 by projection) outlines two rectangles on its both sides. Their diagonals are the sides 3 and 4 of the triangle, and they form a right angle. These rectangles have the same proportion : K = Length/width = 4/3. N.B. : All right triangles have this property with K = great cathète/ small cathète. Before discussing the golden ratio of 3-4-5 triangle, it is necessary to prepare our mind through two historical points. The first concerns the design of this proportion by the Egyptians, and the second approach the notion of surface, as a quantity. The Egyptians think, above all, through angles. The study of the Giza plateau masterfully demonstrates that, 2500 years B.C., these builders of sacred apply four times the golden logic in a wide composition. Later, at the time of Pythagoras, they are perhaps able to integrate the lemmas (external) which integrate surfaces with their values. But when they discover the golden ratio, much earlier in history, this way of thinking is really not theirs. The Egyptian attitude is justified. On the ground of reality, the determination of a point is much more difficult by distance measurement (rope) than the process by angles (triangulation). The theoretical part of the egyptian geometry continues to be at the service of their art, especially architecture. This motivation is reflected in two ways, related and complementary : concreteness and symbolism. The concreteness concerns the works, the accuracy of their implementation as well as in the beauty of the materials. The symbolism is carried by mathematical elements. These mathematics support the works, the numbers coming from the grid like the angles plotted on the same grid. In this way, the Egyptians made from their religion an art. The egyptian approach of golden ratio - Before monstrations A - The golden ratio with the eyes The egyptian definition of the golden ratio does not pass through the calculation. The greek mathematicians have established that the golden ratio is the solution to the equation : φ2 = φ + 1 where φ = (1+√5)/2 ≈ 1,618... In « geometry with eyes », a golden rectangle defines its proportion by itself. It produces a smaller, by removing the inscribed square : • With the same proportions (first definition). • Whose diagonals are perpendicular to those of the large rectangle (second definition). We will discover another definition later, in the same mood. B - A golden rectangle from a double-square The wide angle of the diagonal of a double square is twice the smallest angle of the diagonal of a golden rectangle. This typical example of the grid's logic shows that the golden ratio came very early in the practice of geometers - perhaps even from Upper Paleolithic. It is important to note that the golden ratio belongs to the set of values held by the sacred triangle (this is not the only one). When a golden diagonal is horizontal, the other is that of a double-square. Albrecht Dürer uses this principle in the construction of his engraving Melencolia § I. Here left : the golden rectangle 2x2φ in its natural place, straddling the bisector of order 2. Right : the bisectors of order 1 and 3 are the natural diagonals of a golden rectangle. A circle pointing at the center crosses the lines defining the corners. A - The golden ratio of the sacred triangle - Monstrations First step : the rectangle in position to be studied Let us study the rectangle vertically. Its width is 2 tiles and its height is ∂+1 with ∂, by convention, the diagonal measurement of the double square. Two triangles of Pinwheel with the measurements of 1-2-∂, specify the square of the residual rectangle, placed in the middle and at the top of the square of 2x2 (black). Egyptian definitions Golden ratio When the diagonal of a golden rectangle passes its inscribed square, it puts on the wider side a segment equal to the remaining height to go up to the corner. Double-square The diagonal of an horizontal double-square leaves on the side a segment equal to half of the horizontal distance that it remains to go to up the corner. Observation n°1 The figure of the three diagonals This figure expresses a kind of "principle of the Trinity" The angle between the diagonal of an horizontal triple-square and that of a vertical double-square is the angle of the diagonal of a simple-square. Thus, the bisectors of a triangle 3-4-5 are linked by a simple rule. This property allows us to understand how the ancients have progressed in the study (the obvious, without calculation). The generalization of this principle is in the Appendix. Observation n°2 We know that the small angle of the diagonal of a golden rectangle is half the wide angle of the diagonal of a double square. According to which : The small angle between the two diagonals of a golden rectangle, in its center, is equal to the wide angle of the diagonal of a double square. The second expression of the golden ratio in the triangle 3-4-5 We will note the angles as Ân eg : Â3 for the angle n°3 According to the preamble N° 1 : Â5 = 45° = 90°÷2 Let ∆ the perpendicular to ∆3 ∆3 is the diagonal of a triple-square —> The angle Â1 is thus equal to Â4 We also note that, by construction: Â1 + Â2 = Â3 = Â5 —> Therefore : Â3 + Â4 = Â5 + Â4 We remark that : Â5 + Â4 = Wide angle of the diagonal of the double square, —> thus = Â3 + Â4 too. Quod Erat Monstrandum Properties • The bisectors of order 1 and 3 of the 3-4-5 triangle are the natural diagonals of a golden rectangle • The small angle formed by the diagonals of a simple and a triple-square is equal to the wide angle of the diagonal of a double-square. “T” - Remarkable point of the triangle and of the golden rectangle This method returns repeatedly in egyptian geometry: it suffices to give a new direction to the 3-4-5 triangle to reveal the distances. Let the triangle LEF, the rotation of ABC by a quarter of a turn, and sharing the same circle. By construction : LC = AC = 5. The angles in A and L are the same The lines AB and LE intersect symmetrically in Y, relative to the axis YC of the form - here in yellow. And the center of the inscribed circle is on the line YC. According to the symmetry of this form : LB = AT = 1 (explicit on the grid). A 90° rotation links the triangles, the hypotenuse LE is orthogonal to the hypotenuse AC. A square 1 of 1 highlights the points of tangency of the hypotenuses H and S. LE is thus the perpendicular bisector of the segment AC, and T is the middle. These achievements will greatly simplify the continuation of this exploration. And we will take the same type of figure to complete its measurements. Look at the kite yellow and orange. We have found the measures of the orange quadrilateral : 1 and φ. What about the yellow one ? Its “crosstie” is by construction, a segment of the diagonal of the golden rectangle, thus orthogonal to that of residual rectangle. The measure of the two head segments of the quadrilateral is φ (established). The angles at the point T, and at the bottom of the rectangle, complete a kite, similar to the orange one. Because the angles of the head triangles are the same (last element, α). The same type of observations on angles and segments, allow to continue the chain of kites. They are glued to each other with a 90° rotation and they reduce the preceding measures by φ. It is interesting to place the incircles at each step. The yellow one is the inscribed circle of the triangle 3-4-5. These circles are tangent to the four sides of each kite, and they serve as an alternative to the conventional presentation of the golden logic, which appear only with the squares.. The kites, fruits of successive divisions by the golden ratio, combine to form a golden spiral. It converges in T, the point where the diagonals of the golden rectangle and its residue intersect the hypotenuse of the triangle - at a unit from the upper point. The triangles BYL and TAY are symmetrical on either side of the bisector of order 3 (CO diagonal of a triple-square). These triangles are right et they share an other angle with triangles of type 3-4-5. The sum of the three angles is equal to 180°, thus the third angle is the same too. BYL et TAY are of type 3-4-5. LB = 1. So just divide the measures 3, 4 et 5 by 3 to solve the figure of triangles BYL and TAY. The results are 3/3, 4/3 and 5/3. The height of the 3-4-5 triangle, standing on its hypotenuse, is (3x4)/5 = 12/5 —> It is the “altitude” of the point T above LC. This monstration needs a chapter. —> Consequently, T is located at 12/5 x 1/3 = 4/5 on the right of the vertical AB. If we sticks to its classic golden construction the point T has an irrational status. This figure explains, by the magic of angles, that its position on the grid is perfectly rational. This comment has to enter the file of the "crisis of immeasurable" that shook the mathematical Greece. A kite sides 1 and φ marks half the golden rectangle hanging at the top. Its tip is at the top of the triangle and its tail is on the horizontal line at the level 2, on the grid. The almond that forms the circle of radius 1 around this point with the inner circle measures φ. The two centers are separated by √(3 - φ). Between the two centers of the circles of radius 1 there is, by construction, the diagonal of a golden rectangle. Width φ - 1 = 1/φ, and height 1. To define a pentagram, the minimum material is an angle between two branches, and the measure of a segment, whatever it is. This is precisely what gives us the figure above. Simply develop a golden rectangle downwards from the point that we have found, “pointing φ”, accompanied by its circle, radius 1. The figure with this new rectangle and its circle expresses the golden ratio : the circle of radius 1 highlights two brands, two successive divisions of the large rectangle. DNA... This confrontation of two minimalist definitions also exposes the binding of the pentagram with the golden ratio. And this skeleton imbricates, in the process of building, the structures of the golden rectangle (in yellow) and the star. This is remarkable. About the number φ, we are accustomed to consider the pentagram and its relations in arithmetical terms, when the original definitions are geometric. We understand with eyes. Finally, this figure refers to the 3-4-5 triangle through its golden rectangle of reference, attached to its top. Who would have thought ? Egyptians ! Monstration This pentagram takes the axis of the almond, where φ is also the measure of its tip. The star then takes the measure where it is at the origin, as the upper side of a golden rectangle The pentagram appears tilted so unconventional but its orientation makes sense : the line that is considered its vertical when standing upright (blue) is parallel with the diagonal of the golden rectangle (red). This referent rectangle takes the first measure of φ, which leads to the center of the second circle, and grows down with its height φ2 = φ+ 1. Penrose modules make this building quite educational. In this spirit, the construction of the inverted pentagram and some complementary lines gives a contribution. The accuracy, in the field of egyptian geometry, involves many strategies including this one. In the end, this pentagram with a casual look binds with intelligence with the triangle, while itself stems from the figure of the diagonals. Eg the point of the pentagram on the bar of the golden rectangle (of “reference”). Its inferior bar aim for the tip of the pentagram (Kite 1 and φ). Remarks 1 - Many coincidences of figure demand the accuracy of trigonometry : their precision is then a few thousandths (margin). In contrast, those available to the logic of eyes are correct. Amazing, isn't it ? 2 - Without knowing the structure of the triangle, or the figure of the diagonals, this construction is simply unimaginable. This square takes its name from the circle of diameter 2.φ that it accompanies. The circle of the Pope has a great importance in the composition of Tarot (version Dürer / Conver). It perfectly describes the curve's of the Pontiff's garment, exposed by the blade V of the Major Arcana. More broadly, this measure 2.φ comes back often in sacred geometry. It is often the “dimension of the scene” in a painting. First step Here is another way to present the unfathomable abundance of ratios between the sacred triangle and the golden ratio. All the (de)monstrations are made with the same arguments as the firsts, with neither Pythagoras, nor square root : this is a geometry with eyes (by the concreteness of pictorial representation). The first step is to divide the square of the inner circle by φ, and to draw a diagonal of the rectangle (which measures 2 by 2/φ). Second step A rectangle of width 2, as the incircle, and 2.φ height, stands astride the golden bisector coming from the vertex of the triangle, and takes the first diagonal as its own. Third step Consider the small golden rectangle inscribed in the inclined rectangle. Its diagonal intersects the first at right angles, characteristic of golden divisions, at a new golden point (the other is T, that we studied). This point is also on the segment 3 of the triangle, at the height 2, and at 1 unit of the summit. Fourth step The square of the Pope, width 2.φ, has the horizontal width of the tilted rectangle. Coincidences multiply. This visual on the right Placed at the base of the triangle, the square of the pope is the subject of another coincidence: the diagonal of the square passes through the point of separation of small golden rectangle and its associated square. This brings to three the number of significant points. The bisectors which intersect at the center of the incircle defines naturally three angles. Anthony Rédou has been the first to notice the free values exhibited by certain central angles of the triangle : 135° and 45°... And their tangents are equally impressive ! Trigonometry is not antique (it develops really at Renaissance). It nevertheless reveals the internal organization of the 3-4-5 triangle. The order of a bisector is the number of squares of which it is naturally the diagonal. Two by two, bisectors have two angles : one is acute and the other is obtuse - The tangent of the acute angle is “the order” of the third bisector. - The tangent of the obtuse angle is “the order” of the third, preceded by the sign "-". Example: the bisectors of order 1 and 3, coming from the bottom, form an acute angle α, which tangent is 2, i.e. “the order” of the third bisector, coming from the top (golden bisector). The obtuse angle (α + β), has a tangent -2. Monstration I - The sum of angles of any triangle The sumerian and egyptian architectures show a great mastery in angles, very early in history. Here is a first reflection on the ordinary triangle. Here, three identical triangles - to an any triangle, are fixed at the point O by their different apex. Each of the triangles is linked to the other two at a different angle, and three continued lines intersect at O. It remains only to observe, or to admit, the equal angles (Alpha) on the two sides of O. The sum of the three angles is then 180° (or π, or "one half turn"). This is a basic. Could it escape the mind of the geometers able to build temples and pyramids with incredible accuracy from the fourth (Eanna, Uruk) and third (Giza, Egypt) millennium ? The paragonal of the right triangles Let a right triangle ABC, presented in its “classical position”. We can consider that the bisector from B, in red, is the diagonal of a vertical rectangle. We note α1 the small angle of this bisector. We take the rectangle, called modulus, a second time but horizontally turned. Then we place it as an extension to the base. An ensemble of two modulus shows the second bisector, from the first (except the one of the right angle). The right triangle can be summarized in two values. Its right angle allows to convert them “directly”. However, instead of considering the apparent measures of the triangle, we enter into its internal structure. A triangle DEF appears with a right angle, so two 45° angles =(180 -90°)/2. But 45 ° is the angle of the bisector of the right angle in C of the initial triangle. It is also 90°-45°, the result of the sum of the angles of the two other bisectors. I.e. the sum of α1 that we have defined, and α2, the bisector of the angle in A. EF, in green, makes with the horizontal the exact angle of the bisector of the angle in A. Raphael Legoy has attributed the name of paragonal to this line. The second bisector of a triangle is the 45° rotation of the first (the third concerns the right angle). And α1 + α2 = 45°. Remark The properties of angles that begin this appendix are unlikely to have preceded the discovery of particular cases (especially the 3-4-5 triangle). Generalization of principles is a recurring phenomenon in the development of mathematics. This study itself has followed this path : from the 3-4-5 triangle to the right triangle, then to the any triangle... The Pythagorean theorem must also be seen as the result of a gradual awareness. The character of Pythagoras Pythagoras is clearly not the discoverer of that symbolizes his theorem. The Vedic India or the old China practice long before him an areas geometry, based on what is called the theorem of the diagonal. And in the famous tablet Plimpton 322, Babylonians show prime numbers at the confines of very sophisticated calculations on the triangle... We could stop there, claiming that Pythagoras is an usurper ... But two major issues, I believe, arise : - How was formed that summarizes his theorem ? - What is the true role of Pythagorean in history ? His trip to Egypt brings also a third wondering : - What could learn Pythagoras, at a school that bypasses calculation by its geometry, while we revere him for that calculation ? Several layers, several aspects mix themselves, up to confuse history. The latest research establishes by example, that the Pythagoreans have absorbed the Egyptian and Babylonian influences. In this regard, in a first approach, it would be prudent to mention the Pythagoreans more than Pythagoras : its historical aura has always tended to capture everything that was happening in this sphere. As far as that goes, it would be more accurate to speak of a geometry with or without the theorem of the diagonal/Pythagoras rather than cutting in two the history, chronologically, according to the apparition of that theorem. More generally, it seems important to avoid the creation of artificial oppositions between civilizations, on the basis of the little that we know. Cultural exchanges have always existed, particularly at a time when the borders were not yet an issue of conflicts (eg. in the fourth millennium BC). Then, the consistency of mathematics leads us unconsciously to approach them in a mood of absolute, regardless of any external criterion, in particular pragmatic. Finally, when it comes to spirituality we have to confess that the school of Euclid which has formatted our minds, has erased everything. Despite the inconsistencies that threaten all the speeches, the “topic” of Pythagoras remains as fascinating as the one of golden ratio. Both are symbols of an ancient and mysterious world that never ceases to inspire essential issues. Until the certainties will be sufficient, especially to draw an accurate picture of Pythagoras, we have to put on the desk that we know about the context in which he lived. The area and writing The Pythagorean theorem is a didactic expression of the theorem of the diagonal. Here we have a fine example of “progress” in mathematics. The end result is accepted by all, from the surveyor of sacred to the accountant of treasure, including the Euclidean purist. And this unanimity has the effect of erasing all history ! A number of figures of geometry with eyes foreshadow the proof of the theorem. JeanPaul Guichard warns us: it is possible to construct schemes that are more influenced by the speech of Euclid than by the concerns of “antic geometers”. Clearly, a posteriori demonstrations are potentially apocryphal, because they can feed on the experience of the Greeks - maybe our too ! This article (about the geometry with eyes) can help us clarify the status of figures. Some of them are essential in the building of the corpus, while others respond simply to educational needs. Then a reality must be taken into account : the Pythagorean theorem requires writing. The concept of area (surface accounting) associated with it is very difficult in the practice without writing. The historical background can give reality to this idea. Indeed, writing was born in the heart of Neolithic, while its parameters are gathered explicitly. Beyond a simple productive settlement, the neolithic means the grouping of populations in large cities, marked by a social and urban organization. And two principles emerge, tax and property, both of which require the practice of writing and the concept of area (as the amount resulting from the multiplication of a width by a length/height). Without calculation and without tablets taking note of who has paid what to whom, Neolithic cities would be literally unmanageable. The first writings are account books. The geometry with eyes will retain the tradition of unwritten. The grid on which everything is understood, demonstrated and retains with the least effort, will remain the hallmark of this culture throughout its long history. We need to sift through the geometric constructions that seem to prefigure Pythagoras, to identify those who have assumed the transition to the written thought. Figures 3 and 4 below are somehow lures. They will naturally emerge with the the concept of area. But before this, there is no need of these figures to build the corpus of geometry. N.B. : √2 and √5 are not defined under this form by the geometry with eyes. In contrast, the areas of 2 and 5 squares are explicit. Fig.5 This figure 5 enunciates a very different principle : The angle between the diagonal of an horizontal triplesquare and that of a vertical double-square is the angle of the diagonal of a simple-square. There is no question of area, there is no more need to write. This is (still) geometry with eyes. This figure is essential to the corpus. The result is involved in several monstrations and more importantly, it summarizes the relationship between the angles of the three bisectors of the triangle 3-4-5. This is a real basic. Simply place the definition of the area to solve the diagonal of the triple square. In addition, this figure 5 is eerily similar to the one which prove the theorem of the diagonal. Fig.9 Jean-Paul Guichard reports indeed the most direct demonstration of the Pythagorean theorem. Simply juxtapose a square of side a at the foot of a square of side b (with b> a). And then we remark that the two rectangles marked with a red cross have the same area (= a x b). The area of the large square of side b plus the small one of side a, is equivalent to the sum of the empty square, (b-a)2, with the two rectangles marked by their diagonals. Symbolics Another question: the convergence between the figures 5 and 10 does it relate to symbolism ? Sacred geometry does not take geometric shapes as simple objects : it implements their formidable structures. And the “definition” is not limited to system of figures. Numbers accompany their construction - they are therefore essential to any translation into human language. The final one without the other, shapes and numbers are literally dumb. We must associate, understand, the both aspects in the approach of symbolics. The shadow of Pythagoras appears in the background... The Babylonians could give us a nice proof of the relationship between the two fields of symbolism. The tablet Plimpton 322 contains a series of Pythagorean triplets that reflect a deep understanding of the triangle. After a study which involved many mathematicians, remains an enigma. Several types of values can describe the lines of the tablet. The type (a, b) describing their cathètes, or (p, q) describing their paragonales finally (r, s), the intelligent reduction of the above. All these systems show a complete set of primes - the difference in these couples. However, no logic explains at the moment this improbable coincidence. This might be called the conjecture of Plimpton. 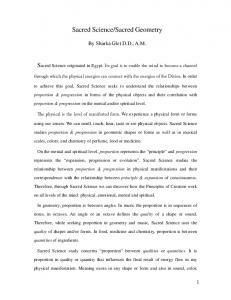 Report "Comparative geometry and sacred geometry. Geometry. with Eyes of Egyptians"